INDUSTRY.co.id - Jakarta - G-SHOCK will soon celebrate its 35th anniversary in April 2018. To celebrate, Casio Computer Co., Ltd., toured 'Shock the World' to various countries in the world for a full year since November 2017 and launched a limited edition collection, one of four red G-SHOCK watches called 'Red-Out Collection'. 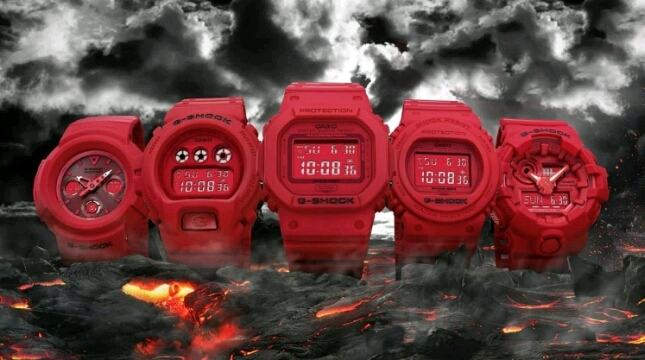 The red color used on these four watches is the typical symbolic color of G-SHOCK. Red-Out Collection is shown in red which is a new coating technology that combines several particles into the paint to give a matte red finish. Almost the entire watch area is red, including the LCD. The touch of black iron that adorned the back cover of the clock and the black watch strap that was also black made the red color stand out. Red-Out Collection carries the identity of G-SHOCK that has evolved for 35 years but continues to maintain its toughness. The back of the Red-Out Collection cover is engraved with the 35-year-old G-SHOCK celebration logo designed by Eric Haze, a renowned graphic artist, while anchored by three stars at the top and five stars at the bottom representing 35 years old G -SHOCK. Red-Out Collection is designed and colored according to the G-SHOCK brand concept of 'Unlimited Reliability'. On December 6th, 'The Father of G-SHOCK', Kikuo Ibe, came to Indonesia and met a number of media crew members. He told, for two years Ibe made various experiments with more than 200 watches, until finally in 1983 he managed to make a prototype G-SHOCK watch called DW-5000C. This classic model still survives to this day, and is adopted by various models of G-SHOCK, including Red-Out Commemorative Collection, the DW-5635C model. "We are quite proud to see that the legendary model of G-SHOCK is still maintained, even becoming one of the most sought after fans. This proves that G-SHOCK does not need to follow trends, but creates timeless trends," said Hirokazu Satoh, Chief Representative, Jakarta Representative Office, CASIO Singapore. The four Red-Out Collection models are an adaptation of previous models. In addition to the DW-5635C that adapted the first model of the G-SHOCK, the DW-5735C is based on the DW-5700 model, one of the earliest G-SHOCK models due to its rounded face with digital LCD. G-SHOCK DW-6935C is based on the DW-6900, one of the most widely used models for collaboration models. While the larger GA-735C made based on the GA-700 is now one of the most popular models in Indonesia.